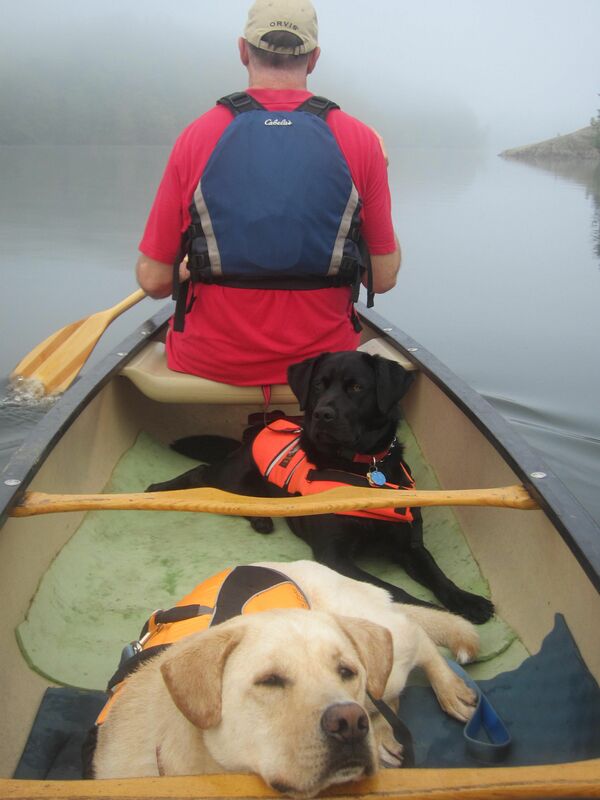 A Foggy Fourth and a little Rant….. | Vermont Paddle Pups! A Foggy Fourth and a little Rant…..
We had a lovely paddle early on the 4th, before the crowds and (most of) the powerboats arrived on the lake. The water level is quite high ( as can be seen in the photo). but the water was calm, and there was not as much flotsam as we have seen other times. The dogs had a great time; it has been very hot and stormy lately, so our hiking and canoeing trips have been a bit curtailed. And now for the rant…as we approached shore to take out the canoe, we saw a large dog running loose, tearing back and forth across the area, running up to other folks onshore, chasing a car at the parking area, and basically, looking to be having a great, (but completely uncontrolled) time. Once the dog appeared to be settled by his owners, along with their other dog, we landed the boat as far away from them as possible. Now, this is not a designated dog beach or dog park; it is a state park, that allows folks, and dogs, to use it before it opens each morning. Normally, dogs are not allowed, except at the boat launch, for loading and unloading boats only. Our dogs, always on leash, were being led away from the boat; suddenly, the active dog came barreling at us from 100 yards away, warp 9, followed shortly by their dog #2. Our dogs get along with other dogs, participate in agility and obedience groups, and hike and snowshoe with other dogs…but they are skittish around unfamiliar dogs that suddenly, or excitedly approach them. We also have trained out dogs to behave at the boat launch, where there may be other kayakers, canoeists, jet-skis, SUPs, etc….The owners could not get their dogs to recall, and they were saying the ANNOYING ” But they’re friendly” . We were accused of being at fault. Somehow, we managed to keep our mouths shut, and not say what we really felt like saying…I know that others feel the same frustration, and I found a great blog author, that sums up our sentiments; check it out!